In 1987 I attended a writers’ conference in San Diego, California, and one of the most engaging speakers was a travel writer who spoke in big words about the romance and excitement of a travel writing career—the free flights, the scrumptious food, the exciting experiences and exotic people. Immediately, I decided that’s what I wanted to do with my life. I bought magazines with travel articles and studied them all, I sent query letters to all the right people, I stole all the in-flight magazines I could get my hands on…sure that all it would take to be a travel writer was my desire to do it. Alas, that didn’t actually work, and it wasn’t until 1992 that I wrote my first travel piece, a little essay about an art gallery in New York City I’d discovered as I wandered through the city on vacation. It was published locally in Albuquerque, in a small publication called Women’s Voices. Since then I have steadily published travel pieces over the years, and I have learned a few things along the way. A quick note is necessary here: travel writing comes in many forms, many of them based on information—giving a reader a basis he or she needs when visiting a place—from The Ten Must-see Museums, to The Five Best Restaurants, to How to Find the Best Shopping, How to Avoid the Worst Tourist Traps, What Roads to Take, What Not to Do, What’s New in Miami or Paris or Minsk, and so on. These kinds of travel articles are less about emotion and connection than are travel essays, in which your emotion, your memories, your personal experience come into play. And travel essays are where a writer will build a devoted audience, readers who wait for the next published piece and who will line up to buy the book that comes out of them. Travel essays are harder to write than how-to or must-see articles; instead of gathering information, organizing it and writing it up, you must be willing to let the reader in to the part of you that no one gets to see, and open up the secrets you don’t normally share with anyone. Travel essays are about putting yourself into the piece. Readers are far more likely to read, enjoy, and want to read more of an author’s work if that author has connected with them on an emotional level. This connection with a reader is more than talking about how happy or sad a place makes you feel, or how full of joy and excitement you are to be there. It’s more than telling a reader how delicious or terrible a particular meal was, or that the streets in Rome are loud. It is all those things, and it’s also about you. How do you feel when you’re in Rome, or New York, or the mountains of Montana, or the horse show in Spain? What memories do the sounds of the sea or the roar of the subway bring up? What do you feel as you eat the cookie baked by the corner baker that tastes like the ones your grandmother used to make? What half-remembered childhood dreams—or future hopes—do the sounds of children playing in the park in London or the local zoo bring to mind, and how does that affect what you do next? These are the moments travel essays explore. They’re hard to find at first and sometimes we must wait for them, but they happen and when they do we must capture them for our readers as well as ourselves. None of us travels in a vacuum. We bring with us our expectations of the place, our hopes of what we will see, our frustrations at our jobs, our desires to escape or to discover or to lose. None of us travels without learning and coming back with something we didn’t have when we left. Often it comes in a revelation, engendered by our encounters with new people and places and food and sounds. Sometimes it doesn’t happen until we return. And sometimes it is the moment of writing about our travels that the revelation occurs. Whenever it happens, it is that essence we must learn to capture and it is in the moment we impart that essence to others that is the magic of writing travel essays. If you are wondering how to do this, the best advice I have is—in the unforgettable words of my first college writing professor—“just write.” There are no secrets that are more important than that: just write. As you travel, write the mundane—where you go, what you see, what you do, who you talk to. And write the next layer—what you felt when you saw, did, talked. And then dive deeper and explore those emotions, the memories they evoke, the moments they bring forth. And then trust that when you write about your journey, all of that will coalesce into a beautiful essay that captures both place and personal, both out there and inside. When you can pull readers in to your heart and let them mingle with all those elements, and then let them back out into the world with this new perspective, you will have succeeded in creating a piece of writing that will keep them coming back for more. You will have indeed tapped into the romance and excitement and wonder that is writing travel essays. Now, where are you going—and can we come, too? Teresa Cutler-Broyles is a local Albuquerque writer who has published professionally since 1992. She writes short fiction, novels, travel essays and nonfiction pieces for both print and online venues. 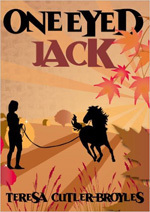 Her small book of travel essays, A Dream that Keeps Returning, is available on Amazon and through her website, and her YA novel, One Eyed Jack, is available on Amazon as well. Her upcoming historical novel set in 1570 Italy will be available in early 2016. She teaches in the Film, Peace Studies, and American Studies departments at the University of New Mexico (UNM); at the Umbra Institute in Perugia, Italy during the summers; at UNM Continuing Education; and with the Story Circle Network online. Teresa runs TLC (travel/literature/culture) Writing Workshops, and Hero’s Journey Tours, in Italy; upcoming dates are May and October, 2016. 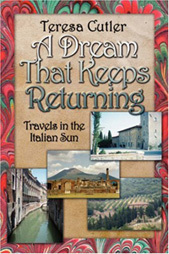 Visit her website for more information: tlcwritingtours.com or herosjourney-italy.com, or send her an email: teresa_intrepid@yahoo.com. This article was originally published in the May 2012 issue of SouthWest Sage and is reprinted here by permission of the author.